Russian President Vladimir Putin during his meeting with Syrian President Bashar al-Assad. The Financial Times report that Russian President Vladimir Putin requested that Bashar al-Assad of Syria resign does not correspond to reality says a Kremlin spokesperson. 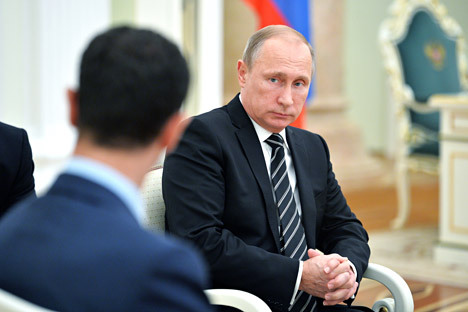 Russian presidential press secretary Dmitry Peskov denied that Vladimir Putin reportedly made an offer to Syrian President Bashar al-Assad to resign. The request was supposedly handled by Igor Sergun, the head of the Main Intelligence Directorate (GRU). “No, that’s not true,” Peskov told the TASS Russian news agency on Friday January 22. The Financial Times, citing sources in Western intelligence, wrote on Friday about a secret mission made by Sergun, whose sudden death was announced by the Kremlin on January 4, 2016. The Financial Times writes that Sergun traveled to Damascus to persuade the Syrian president to resign voluntarily. According to the newspaper President Assad “angrily rejected” Moscow’s offer. Sergun died in early January 2016. Some sources maintain that he passed away in Lebanon, while others state that he died outside of Moscow. The Ministry of Defense did not respond to a request for comment by RBC daily.